The application deadline to apply to IESEG School of Management in France is just over a month away. Anyone applying through Barclay Educational before the May 31st deadline will have the application fee of 80 Euros waived. There is still time to apply to a number of its excellent programs in time for a Sept 2019 class start. There is NO CHARGE to students for our application assistance. As a recognized Canadian agent for IESEG, the university pays our fee. IESEG is a top-rated business school with the distinction of being granted a Triple Crown Rating. This puts it in an elite category of universities (less than 1% in the world) that hold the “triple crown” of international accreditations (AMBA, AACSB, EQUIS). You can find out more about some of their interesting and challenging courses by watching the videos below. International students will receive a tuition fee discount of up to £2500 per year which is increased by £1000 for students from low and lower middle income countries as defined by the World Bank. Courses are taught by world leading experts, researchers and clinicians. If you want to be a chiropractor, this Master of Chiropractic course from the University of South Wales, based at the Welsh Institute of Chiropractic, provides the appropriate clinical education and training to meet registration requirements in the UK. Qualifications are also easily transferred to working back home in Canada. As part of your chiropractic training, you will study the human body in health and disease. You will also be able to identify abnormalities of human structure and function, and manage patients through manual methods. These include manipulation, soft tissue techniques and active rehabilitation. Anglia Ruskin University in the UK is a modern, global university. The University prides itself on partnering with industry-recognized qualifications which are valued all over the world. Here are some of the top reasons you should consider undertaking your undergrad or postgrad studies at this fabulous university! 1. Anglia Ruskin is an innovative, global university with students from more than 185 countries. 2. The University has once again been named as one of the top 350 institutions in the world. 3. You can study in the heart of Cambridge, one of the most famous academic cities in the world. 4. Enjoy another campus in Chelmsford, a half hour outside of London. 5. Choose from a wide range of courses; everything from Optometry and Law to Art and Design. 6. Enjoy multi-million pound facilities such as the Mumford Theatre and new Science Centre. 7. Be part of the thriving Anglia Ruskin Student Union. 8. Choose to take part in some of the 120 student societies. 9. Enjoy thriving city life right on your doorstep. 10. Enjoy university support from Orientation to graduation and beyond! If you would like to find out more about how to apply to Anglia Ruskin, please email Jackie at jsb@barclayedu.com Barclay Educational offers FREE application assistance to anyone applying from Canada. Deciding to head overseas for postgrad studies in the UK or elsewhere is a big decision. One huge advantage is that many MA or MSc degrees there can be completed in just one year, however, it is still a significant commitment in terms of time and finances. With so many options available, how do you go about making the right decision when choosing an Education Consultant to help you decide on a program and guide you through the application process? Here’s some advice from the experts at Barclay Educational Services on the Top Ten Things to Ask. How long have they been in the business? Make sure they have enough experience to help you avoid the pitfalls which are common to students applying for the first time. Do they have a physical office that you can visit if there is a problem? This is an indication of permanence and professionalism. If a situation arises where you need some help, can you be sure your consultant will still be around to solve the problem? What is the quality of the universities that the agency partners with? Good agents will not accept just any university as a partner and avoids sending students to those with a reputation for lacking quality in teaching or research or not providing proper student support. Do the consultants regularly make IN PERSON visits to the universities that they recommend? Good agents keep up to date on the changes made to programmes, campus facilities, amenities and even the nearby towns. What do other students and parents have to say about the Service? Investigate whether they have had a good experience using the Consultant and are confident in recommending it to others. Does the Consultant have regular and direct contact with the International Officers from overseas universities to keep up to date on any new programs, issues or problems? Does the Consultant prioritize the BEST MATCH for the student when assessing universities and program suitability rather than just filling a numbers quota for referrals? Does the Consultant give assistance throughout the ENTIRE application process including help with all the necessary documents needed, as well as the Student Visa if one is required? Does the Consultant have a vast array of experience at the high school as well as the college level so they can be sure that the courses they are recommending are a good fit with previous education? Does the Consultant regularly upgrade their skills by attending workshops, institutes, or conferences? Today, IÉSEG revealed a vast renovation and extension project, the IÉSEG Village, for its historic Lille campus. The objective of this project, inspired by the input and work of the School’s community (colleagues and students), is to create a campus of international standing, offering students a unique intercultural learning experience. Throughout the next three years (2018-2021), the IÉSEG Village (around rue de la Digue/rue Architecte Cordonnier) will be developed in several phases (see below). Certain existing buildings will be renovated and expanded, and a new building will be constructed at the extreme southern part of the campus. “Following the opening of the new building in 2017 on the Paris-La Défense campus, we are delighted to reveal this project for our historic campus in Lille. 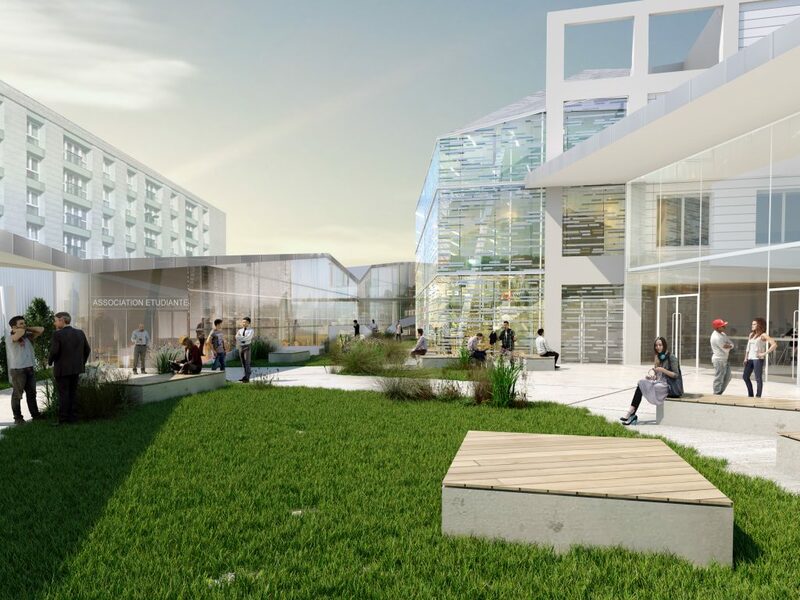 The objective is to create a campus of international standing for 2021, a true village in the heart of Lille and the Vauban neighborhood, which will allow the School to provide its students with a unique and intercultural learning experience,” Jean-Philippe Ammeux, the Director of IÉSEG, explained. With a new architectural impact and green spaces, this project was inspired by a collective work within the School, in the framework of the Vision process. A work group (staff and students) has worked on the IÉSEG Village program in close collaboration with the executive management. Over 1,000 members of the IÉSEG community (students and staff) filled out a questionnaire or participated in interviews to collect different points of view, opinions, and expectations regarding this ambitious project. Overall, more than 4,000 m2 extra will be created in the framework of the IÉSEG Village, a project that will be realised with Trace Architectes and TPF Ingénierie. Representing an investment of 21 million euros, this project will provide the School with the opportunity to pursue its development. It will also accompany the implementation of its pedagogical strategy, launched in 2016. The objective of this strategy is to create a unique experience which is centered on intercultural learning and student engagement. Classrooms and common spaces will be designed to encourage the exchanges and the implication of each student through individual and group activities. Also, the student associations, which are at the heart of the IÉSEG student experience, will occupy a new building at the South of the Village. • A sustainable campus: triple glazing; reinforced insulation; green roof; rainwater harvesting etc. Newcastle University has just moved up 20 places into the top 150 in the QS World University Rankings 2019. They are ranked joint 141st in the world, up from 161st and 119th out of 1,011 institutions for graduating the best students. “Our performance in the latest QS World University Rankings reflects the impact of our world-class research and our commitment to high-quality teaching and preparing outstanding graduates. Here is a link to Newcastle University’s post-grad programs. If you’re considering studying for a post-graduate degree overseas, there is still time to apply to a number of top-rated universities in France or the UK. One of the biggest advantages of heading overseas is that many Masters programs take just one year of full-time attendance to complete, versus the two years which is often required in Canada. You can also complete a teaching degree in just one year or an Accelerated Law Program in just two years. Both qualifications are easily transferred to working back here at home. An added bonus; you’ll likely be accompanied by other Canadian students in your program, as more and more head overseas to complete their studies. Many of the UK universities for example, now have Canadian Law Society’s to support the growing number of students enrolled in their programs. Barclay is proud to partner with almost 25 universities which are recognized both for research and teaching excellence. Spaces are still available for September but you have to get your application in soon in order to be able to complete the required (and sometimes complicated) Student Visa Process. We are paid by the school so our counselling assistance is completely FREE to students. Our staff will assist with every stage of your application from choosing the correct program to transferring transcript information. Below are a number of links where you can explore programs at the University of Southampton, University of Portsmouth, Aberystwyth University, University of Exeter, Newcastle University, University of South Wales, University of Strathclyde and IESEG, one of the top-rated business schools in France. If you find anything that interests you, please contact Jackie at JSB@barclayedu.com We’re happy to answer any questions that you might have.